Do you have a question about EverPanel? Browse the below list of frequently asked questions. Click the question to go directly to the answer. If you do not see an answer to your question email us at sales@everblocksystems.com. What Are The Benefits of Using EverPanel? How Stable Is An EverPanel Wall? Can I Include A Door Or Window? Can I Hang A Traditional Swinging Door? Can I Hang Art from EverPanel Walls? What Color Does EverPanel Come In? How Much Do The Panels Cost? Any Discounts? Have The Panels Gone Through Fire Testing? Can I Build A House With EverPanel? Can I Paint Or Cover EverPanel Walls? EverPanel is a modular wall panel system that consists of specially designed lightweight wall panels that interconnect to create walls for offices, residential spaces and commercial locations. The EverPanel system can be installed in minutes by only 2 people, allowing for complete large office builds in less than a day and for reconfiguration of walls as needed. Panels are easy to clean using standard household cleaners and are stored compactly and transported efficiently. Having a modular system like EverPanel allows for tremendous flexibility. No tools, contractors or extra building materials are required meaning that you don’t need to disrupt your team with noisy and dirty construction. Our panel system is designed to be used again and again to create unique configurations for offices, residences, retail spaces, and public facilities. 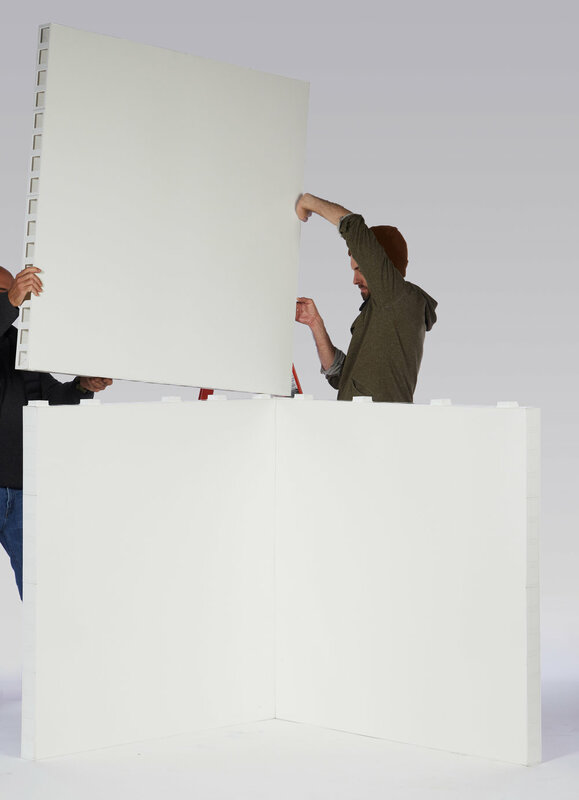 Simply break down EverPanel room dividers and bring them with you to another location. Additionally, EverPanel is water resistant and may be used in wet or moist areas where standard sheetrock, wood, or other materials aren’t suited. There are 8 EverPanel sizes, which can be mixed and matched as necessary for your specific floor plan and layout. EverPanel currently has multiple functional and design patents pending on its unique modular wall panel system. The panels incorporate unique functionality that has never been used before - from its unique connection system to its internal support structure, the EverPanel truly is a revolution in modular and temporary wall system design. EverPanel is used by offices, residences, government agencies, retail spaces, events, exhibitions, and anyone who needs a demountable wall system. EverPanel is ideal for creating conference rooms, offices, cubicles, factory spaces, apartment shares, and for converting raw spaces such as lofts, basements, warehouses and bare retail space into multi-office/multi-room spaces. Anyone who wants to avoid sheetrock, wood, paint, tape, studs, and other standard construction materials can use EverBlock to quickly deploy a wall. Anyone looking to minimize downtime and eliminate the noise and dust from construction is a perfect EverPanel candidate. Where To Begin Designing An EverPanel Wall? EverPanel walls are quite stable, when assembled in the proper configuration. When building walls, we recommend using corners and columns to add stability to your design. We also recommend adding columns in the form of “L’s” or “T’s” to each side of a wall, for additional support. In walls longer than 20ft. we recommend adding a middle column as well. Add Lug Connectors as needed between stacked and adjacent panels for additional strength and place Inter-Panel Connectors between adjacent panels to prevent separation. Yes, EverPanel offers an accordion door system which works seamlessly with the blocks. We also offer various sized polycarbonate window panels that work with traditional EverPanel sections, allowing you to see though the window panels. If you want to insert your own door, window, or accessory, we recommend reinforcing the area around by framing out the opening as you would a traditional door or window. You can screw right into EverPanel using standard sheetrock screws. Can I Hang Art From EverPanel? Yes, EverPanel is stable enough to hang standard pictures and paintings. You can either drill into EverPanel to place a mounting screws or can use wire to hang art using loops placed around lugs placed at the top of the wall. We do not recommend hanging art that projects far off the wall (such as animal busts) and which could create a weight imbalance. EverPanel is proudly manufactured 100% in the USA, in Bronx, New York. We ship our products globally. Panel are generally transported on standard 40” x 48” pallets. For smaller shipments or for shipments to locations that cannot accept a pallet, there is the option of shipping panels and accessories via UPS boxes, though that typically adds some cost to the overall shipment. EverPanel has a warehouse and manufacturing facility in Bronx, NY and we ship throughout the USA, Canada. In addition, EverPanel has Agents who operate throughout the world and have inventory that they can ship to within each respective region. For regions that are not served by a local agent, we can arrange shipping directly from the USA. What Colors Does EverPanel Come In? At the moment, EverPanel is only available in White, however we do offer accessory EverBlock’s that are used to add a splash of color to wall designs. Blocks are inserted above or below standard EverPanels and can be used to create patterns and visual interest. We also offered colored finishing caps which can be used to add a splash of color on the top of pony walls, in window openings, or on top of cubicles. Select from between 16 standard colors (including a translucent block to allow light to flow through) and mix and match colors as needed to achieve your architectural and design goals. We offering quantity discounts for orders over 30 Panels (mix and match sizes as needed) and additional discounts for orders of over 100 panels. Educational discounts are available for qualified educational institutions and registered non-profits. Standard EverPanel have surprisingly strong sound dampening qualities, better than most standard temporary walls. Each panel consists of a 3” internal air chamber and two composite panels fastened around a framework skeleton. The air provides both a level of thermal and sound insulation. Optional acoustic foam insulation is available at an additional cost and must be specified at the time of ordering. This foam will both further dampen sound and provide additional thermal insulation benefits. The largest contributor to sound transmission is the open area above a temporary wall. Some thought should be given to closing this area to prevent unwanted sound migration. Have The Panels Gone Through A Fire Test? EverPanel he undergone rigorous fire testing and passes ASTM E-84 at Class C. This signifies that EverPanel has has passed rigorous flame spread requirements as well as produces smoke less than the maximum permitted under Class C.
Theoretically EverPanel can be used to build complete houses, however we have not yet constructed a full scale house using this system. While EverPanel can be used both indoors and outside and varying climates, we continue to perform testing towards the goal of creating fully modular homes using EverPanel and related accessories. We and expect to have enough information and testing ready to build a full scale home in the not-to-distant future so check back often to stay abreast of developments on this front. For builds that require a roof, we suggest using plastic or metal corrugated sheeting over wooden stringers. Stringers may be laid on top of EverPanel sections and fastened using zip ties or wire, though some reinforcement might be required, depending on the expected loads. Can I Paint or Use Wallpaper With EverPanel? It is not recommended to paint EverPanels as the surface is not conducive to painting and is difficult to adhere to. It is possible to use standard adhesive backed wallpaper to add color or texture and to create a different, more customized look. To avoid seeing seams between panels, when applying adhesive backed wallpapers, we recommend applying standard construction seaming tape over seams before wallpaper is adhered. The EverPanel themselves are waterproof. When building walls and structures to resist water infiltration, we suggest sealing the seams between EverPanel sections using water resistant tape. This prevents water penetration from the outside inwards. Panels may be placed in wet conditions, indoors and outside, and may even be submerged in water if needed.